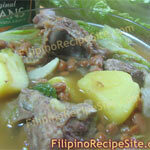 In a pot, boil the ox tail, leg and tripe along with achuete seed until tender. Blend in ground peanuts and rice. 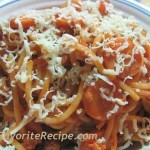 Add the sliced half-cooked eggplant,sitaw, and puso ng saging. In a saucepan, sauté onion and garlic. Add bagoong. 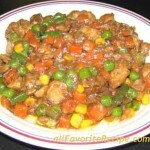 Serve meat and vegetables withbagoong mixture.